The life expectancy of Labrador Retrievers can be anything between 10 and 14 years. Just as with humans, that figure can vary widely, but a good average for Labradors is 12 or 13. Of course, good care and balanced feeding, regular exercise and plenty of mental stimulation, frequent health checks at the vets as well as freedom from disease can ensure that your lab enjoys a good long life. It should be realised that health problems amongst labs are often inherited, so healthy parents are likely to produce Labrador puppies who will enjoy a longer than average life. 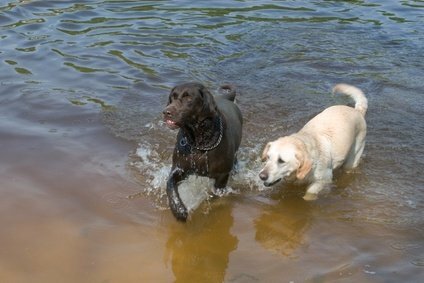 Many of the inherited health problems that can impact on the life expectancy of Lab Retrievers are the result of over breeding. So, when acquiring a Labrador puppy, it is important, where possible, to buy from a breeder who is able to check for inherited disorders. And remember, your pet lab is a late developer and will have a long childhood, not reaching adulthood until he's three, a year longer than the two years associated with most breeds. Incidences of the dread disease cancer among Labrador retrievers are rising, and that is leading to the deaths of younger dogs. Labs are also prone to serious health problems, such as with their joints and bones, hip and elbow dysplasia and epilepsy as well as osteoarthritis which is prevalent in older dogs. Heart disease and diabetes are illnesses associated with the breed, and of course, these illnesses can also reduce the life expectancy of Labrador Retrievers. These ailments can be avoided by providing a good diet and regular exercise. This is very important as Labrador Retrievers are a breed renowned for having a good appetite leaving them prone to obesity which can lead to associated problems. This is why it is vital that you ensure your lab takes plenty of exercise. Just like people, Labrador Retrievers vary in temperament; some are placid while others are boisterous. But, in general, they are energetic dogs who enjoy being active and require vigorous exercise. They need a large backyard or garden where they can run around. Games of fetch and taking them long walks every day will reduce the risk of obesity and the associated risks of heart trouble and arthritis. Taking your dog out for exercise will also do you the world of good as he walks alongside you, or gives chase as you pedal your bike. It goes without saying, a healthy dog will increase the average life expectancy of Labrador Retrievers.